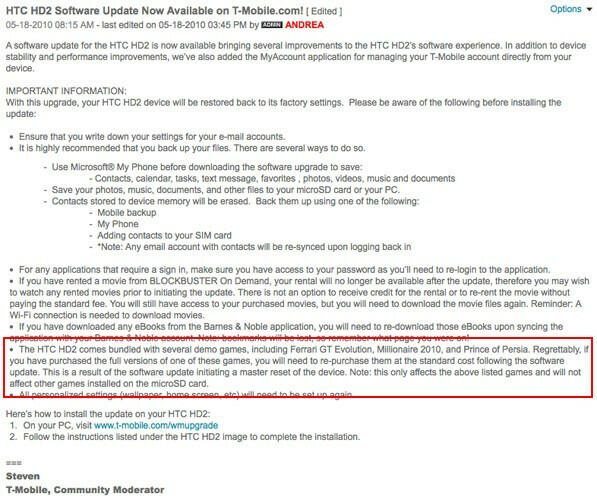 There's no arguing that T-Mobile did it right by grabbing at the opportunity of getting the Windows Mobile powered HTC HD2. They've easily managed to exceed expectations as there are still people looking to purchase the some times hard to find smartphone, but the arrival of a new update may cause some internal strife for owners. Everybody loves software updates as they offer some “stability and performance improvements” that'll surely better the overall experience – and that's exactly what the latest HTC HD2 ROM update does. Unfortunately that isn't the only thing that's on-board with the update as it's stated in the fine print that installing the update will wipe out some of the demo games preloaded with the device that you might've played and eventually purchased. There isn't any solace from T-Mobile just yet as it's also clearly stated that you'll have to “re-purchase them at the standard cost.” As much as this will undoubtedly be an inconvenience to some owners, we'll see how things pan out in the end. We received an e-mail at our store with printouts for customers to backup their info to their computers. They never told us customers would lose their games. That's kinda dumb if it's true.